Olivia Peterson was born in Jackson, Michigan. After obtaining a Bachelor’s of Science degree from Michigan State University in the field of zoology, Mrs. Peterson attended law school at Michigan State University, College of Law. Mrs. Peterson initially practiced in the area of debt collection before joining the firm of Bodwin & Associates in 2009. During her time at Bodwin & Associates, Mrs. Peterson gained experience in the areas of insurance defense, municipality law, criminal prosecution, estate planning and contract disputes. She has trial experience in the area of property defense and contract enforcement. 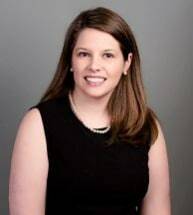 Mrs. Peterson moved to Kentucky in 2012 and has been with the firm of Casey, Bailey & Maines, PLLC. Mrs. Peterson primarily practices insurance defense and civil litigation, which includes motor vehicle accidents, premises liability, property damage and insurance agency negligence.